Download the 30 day trial of MailSuite. Purchasing remove the time limitation on the trial. 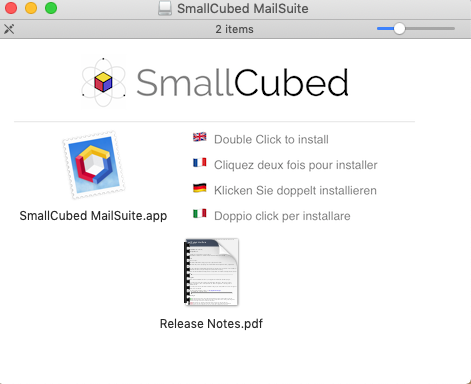 To install MailSuite, double-click on the scs.x.x.dmg file in the downloads folder then drag the MailSuite app into the Applications folder. 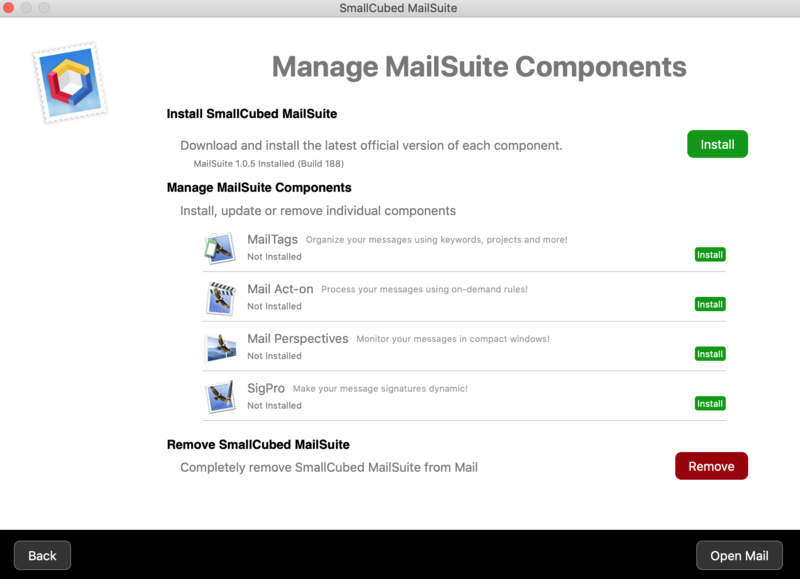 Open the MailSuite app, select the components you want to use ( MailTags, Mail Act-On, Mail Perspectives and/or SigPro). Once MailSuite had FullDisck Access, you can add the components you want to use (see image above). Also, in Mojave, when you first start Mail after adding the components, you will need to enable the MailSuite plugin in the “Manage Plug-ins” setting from the General tab of Mail’s preferences. 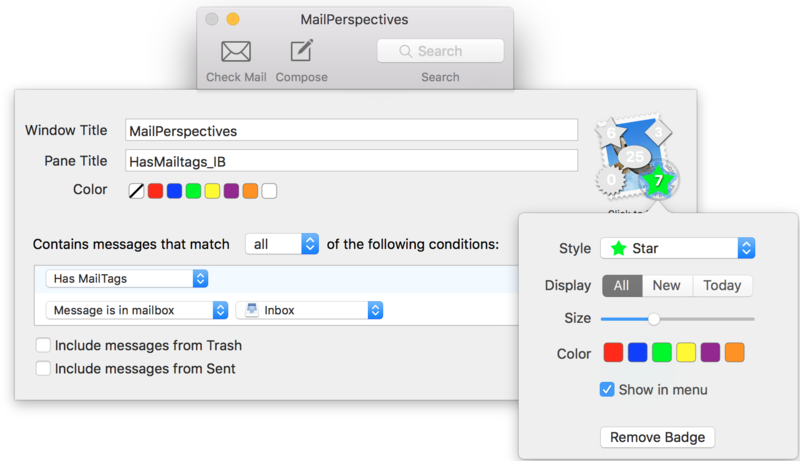 In Sierra, High Sierra and Mojave, once Mail Perspectives is installed you can access its preferences through the Mail Perspectives tab in Mail’s prefernces. 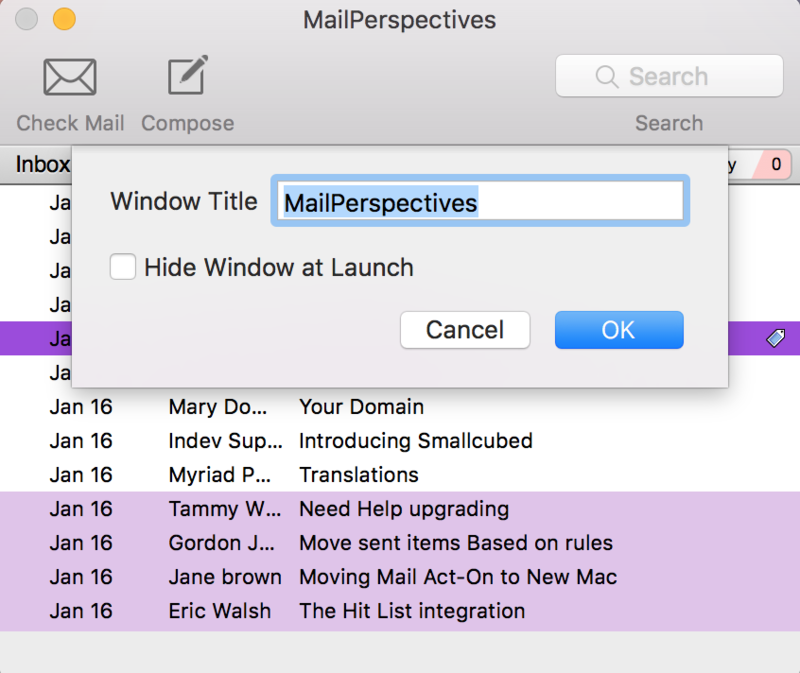 Create Perspective windows by selecting “New Perspecives Window” in the “File” menu of Mail or by right clicking on any mailbox or smart mailbox and selecting “Open in New Perspectives Window”. While the Preview window is open, move to the next or previous message from the Mail preview window by using the down and up arrows on the keyboard. 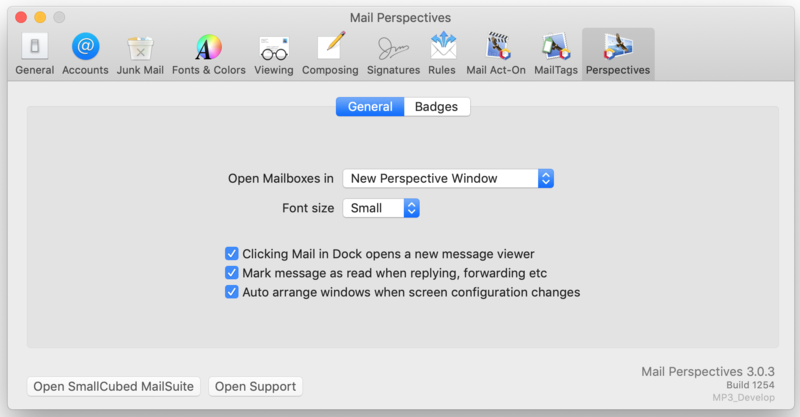 Edit a Perspectives window by right clicking on the Mailbox name and selecting “Edit”. 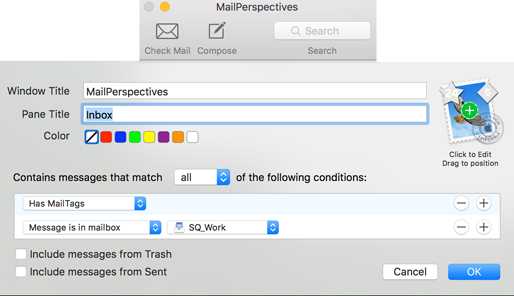 In the Edit view, you can change the criteria for the perspectives window similar ot editing a smart mailbox. To change the title of a Perspectives window or to set as hidden at launch, right clicking on the window name and selecting "Edit Window settings". 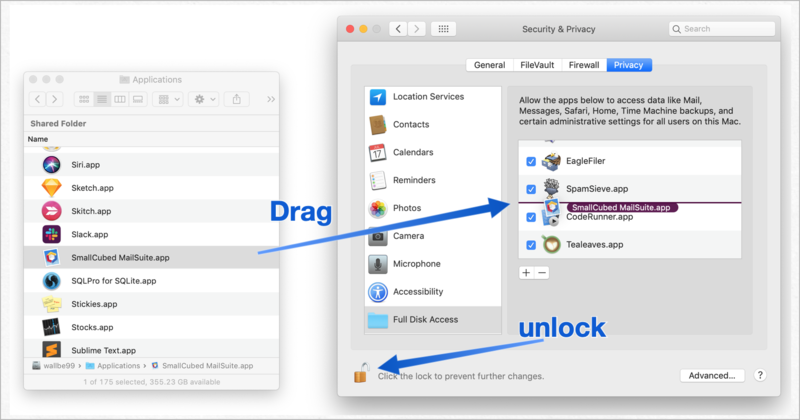 Check or uncheck the option to "Hide Window at Launch" to set whether the window is usually seen or unseen. Show/Hide the the toolbar on any Perspective window, by going to the Mail View menu and selecting “Hide toolbar/Show toolbar. Show/Hide individual Perspective windows by clicking the red close button. 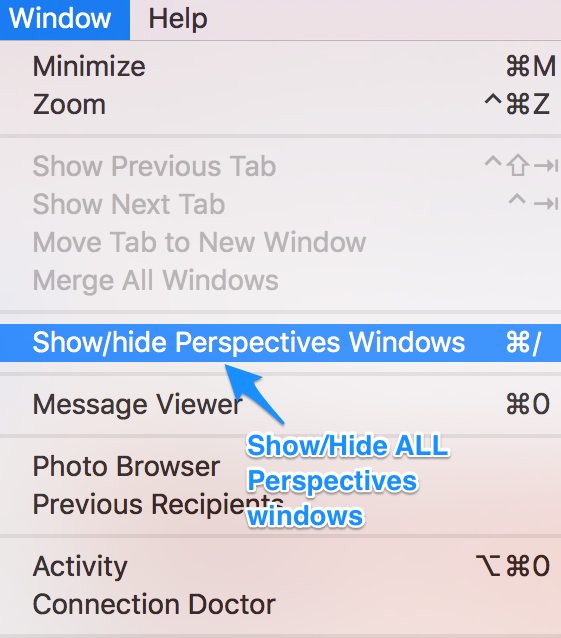 Show/Hide ALL Perspectives window using the Mail’s menu “Windows/Show/hide Perspectives Windows” or using command + /. 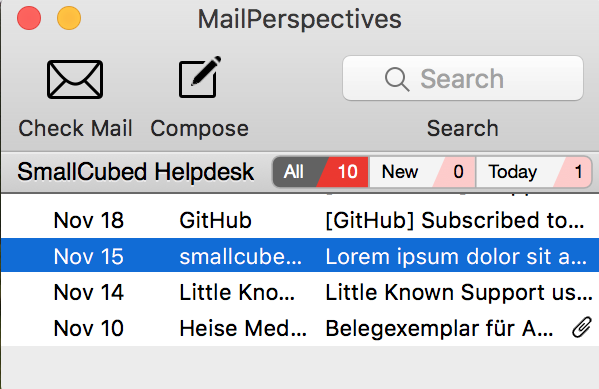 A list of closed Perspective windows can be found in the Windows menu of Mail. Clicking on a the title in the list will reopen it. Get rid of a Perspectives window by hold the “alt” key while click on the red close button. 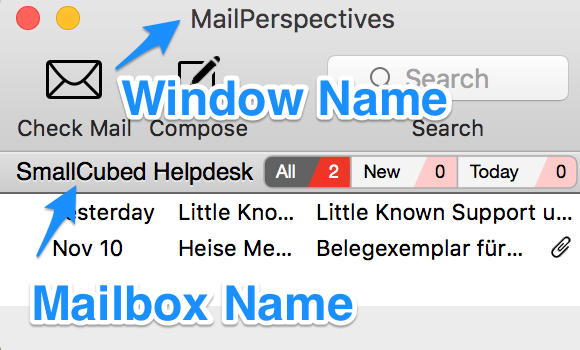 Create a Perspectives window with multiple panes by draging the title of one mailbox window onto the window of another. Once grouped, the group can be moved together as a single unit. Edit the color of a pane title by right mouse click on the pane title. Expand or compress a pane in a window by double clicking on the pane title. To return to the regular view, double click again on the same pane title. 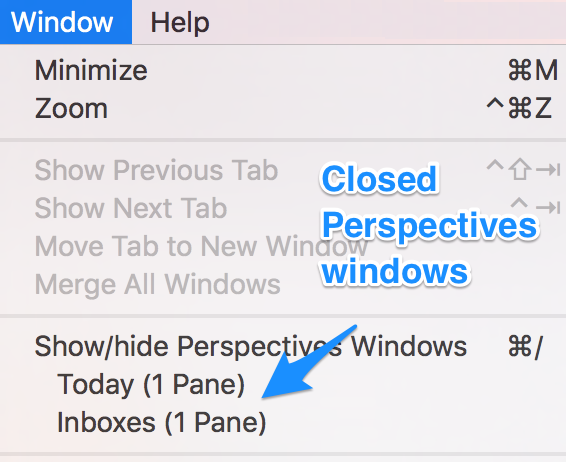 Show/Hide Perspective a window with multiple panes the same way you would an individual window by clicking on the red close button on the top left of the window, or with the Mail Window menu or by using ‘command + /’. 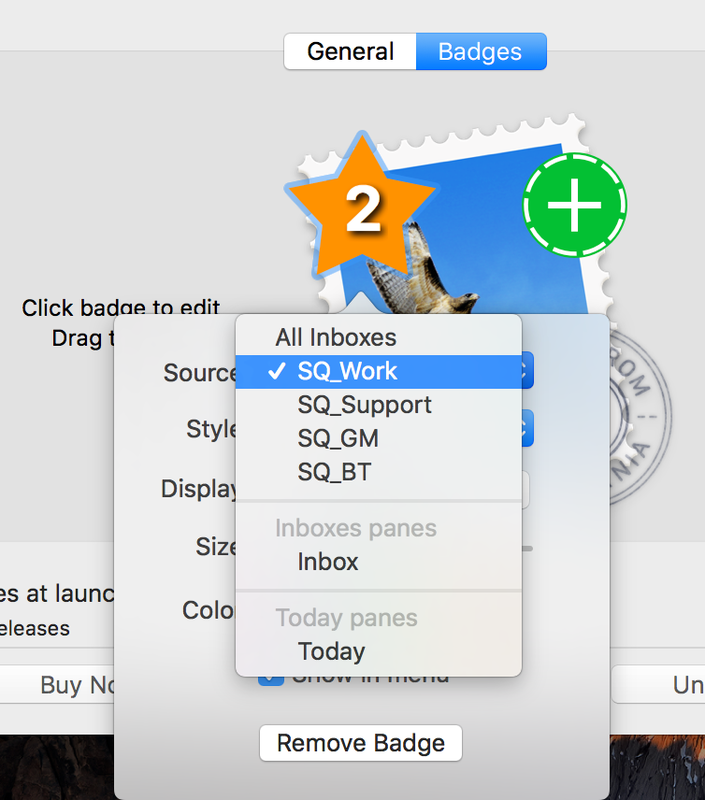 A badge can be added to any standard Inbox, or existing Perspectives pane/mailbox. 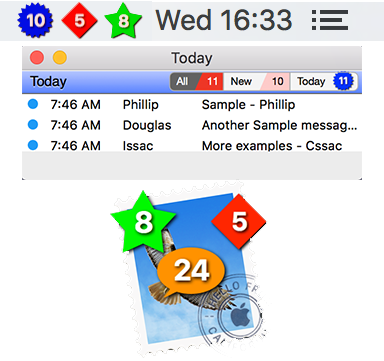 They display on the Mail icon in the Launch Menu, on the the Perspectives window, and optionally in the Menu bar for easy visibility when in other applications. 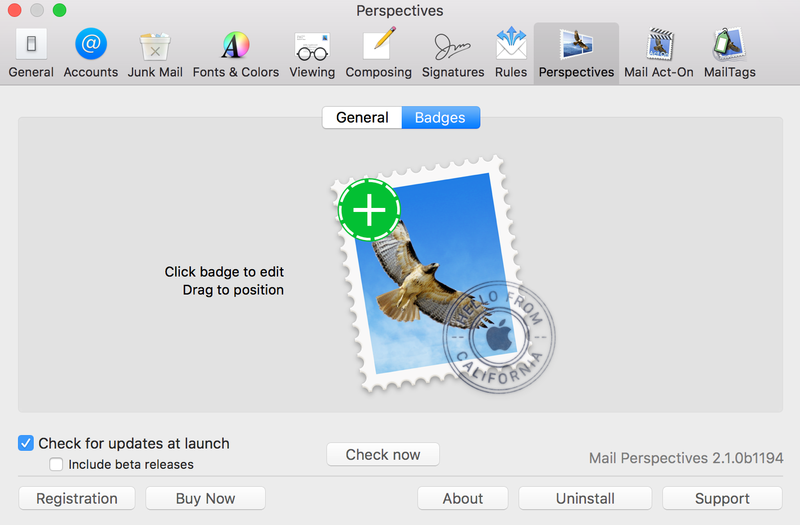 Up to 5 Perspectives windows can have badges, one in each corner of the Mail icon on the Launch Bar and the fifth in the center. 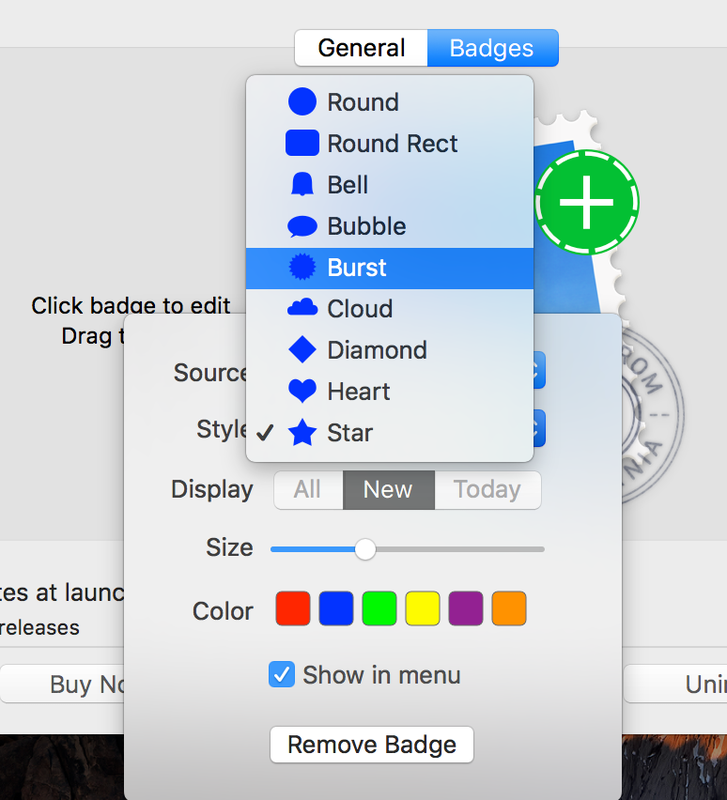 Badges can be created from the “Badge” tab of the Perspectives preferences. When created from the “Badges” tab, the source messages can be any or your Inboxes, the combined Inbox, or messages that arrived “Today”. For this type of Perspective window only “New” messages (unread messages) can be counted for the badges. Badges can also be created from the “Edit” option in the Perspectives window. Once in the Edit view, click on a green plus sign on the Mail icon and edit the badge color, shape and count. With this type of badge the count can be displayed as “All”, “New”(unread) or “Today”’s messages. Drag the badge to on the Mail icon to change its location. 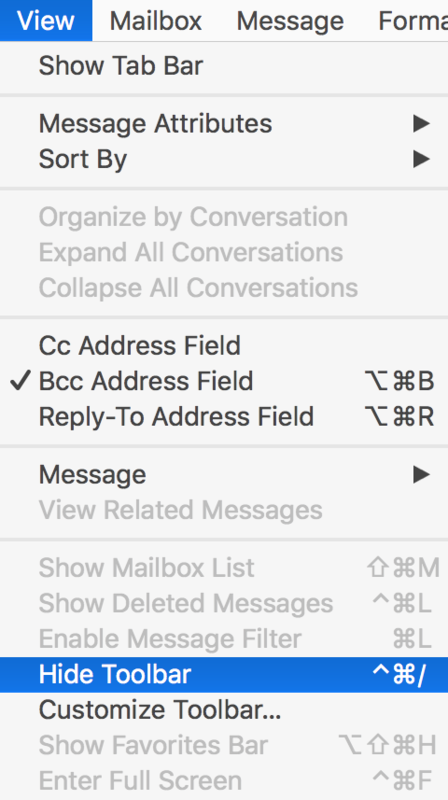 Apply Mail Act-On actions on selected messages using the same quick keys you would usually use to invoke the Act-On Menu (F1, F2 …). Or apply Act-On rule using control + the Act-On key. 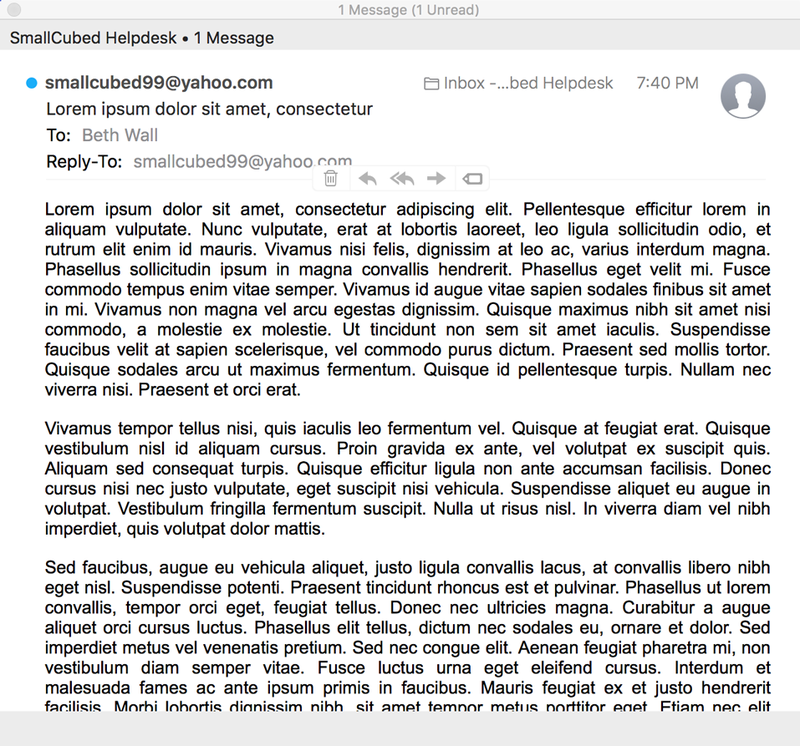 With Mail Act-On installed, and the Act-On “Message Viewing” option to delay the message from being marked as read immediately, it is possible to scroll through messages, or the “Quick View” window with out the messages being marked as “Read”. 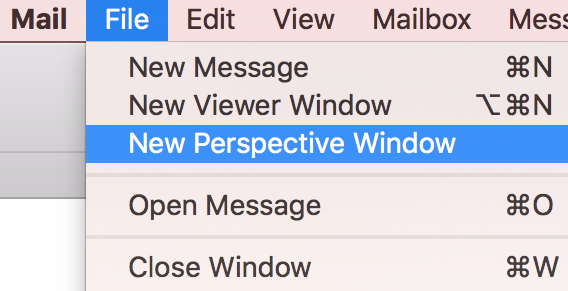 To mark messages as “Read” use the “r” key, either in the Perspectives window, or in “Quick View” window. If you have further questions, or Mail Perspectives doesn't act as you expect, you can contact us at the following email address: support@smallcubed.com.